This chapter introduces the overall content of the book. Firstly, the introduction explains why meat is today a hot topic and how the issue of meat has grown in the Western culture generation after generation. After a brief account of how eating an animal strikes the deepest chords of the human being, the chapter focuses on the research methods adopted and on the definition of cultural history that the following chapters imply. 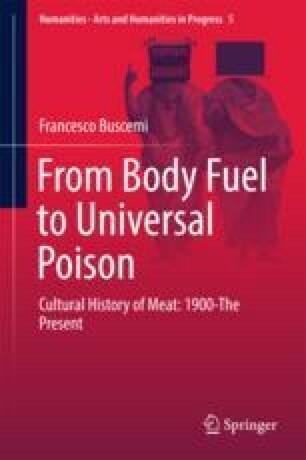 Moreover, apart from the dominant theme of meat, the introduction also suggests reading this book as a compelling account of what has happened in the Western world from 1900 to the present (with some prediction of the future), as meat has often mirrored wider social, cultural and political changes occurred in this period. The detailed description of what the reader finds in the rest of the book and the explanation for the presence of a short story at the end of each chapter close this introduction.